One city of two million people and only three months to find her. 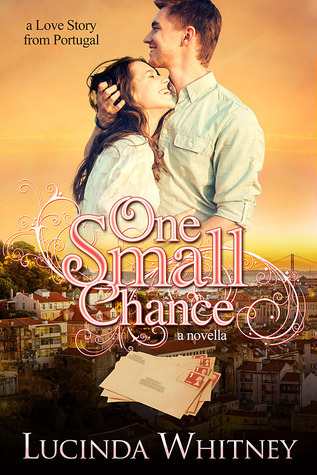 One Small Chance is a standalone novella of 43,000 words and it’s set in Lisbon, Portugal. It’s a clean and wholesome contemporary LDS romance. If I were to describe this story in one word, it would be hopeful. Simon is so hopeful that he'll be able to find his longtime pen pal, Amelie, while on a short-term job in Lisbon. And he literally runs right in to her. What are the chances? Isabel is worried about her job when Simon shows up, thinking he's there to replace her, but as time goes by, she's hopeful they can forge a lasting friendship...or more. How often do we miss out on some great thing because of the packaging or our preconceived ideas? Simon isn't a drop-dead gorgeous man, but he and Isabel have connected through their souls for years. It's frustrating to see her miss out because she can only see what she wants to see. Each of these characters brings something to the table and they complement and balance each other so well. I really liked them and the way they gradually came to realize the truth. There is an added element of mild suspense, which is the true reason why Simon is there and I thought that brought a nice depth to the story. This story has a nice "You've Got Mail" feel to it, with enough twists to definitely make it stand out. Although a novella, I found that it was thorough enough to really warm the reader's heart and left me feeling very satisfied. Content: mild romance; mild religious elements, specific to the LDS faith; very mild violence. Clean! Lucinda Whitney was born and raised in Portugal, where she received a Master’s degree from the University of Minho in Braga, in Portuguese/English teaching. She lives in northern Utah with her husband and four children. When she’s not reading and writing, she can be found with a pair of knitting needles, or tending her herb garden. Thanks for the review, Katie!